Espada was designed for theknitter.com’s sock of the month club for June 2008. 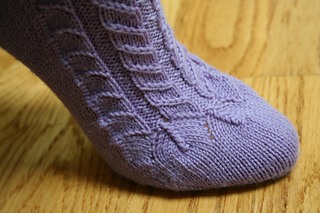 The sock is knit toe-up and does include a gusset. The name Espada comes from a mission near San Antonio, TX that has columns and arches, like the columns and arches on the sock.